On Saturday 19th November, I visited Mt Rosea and Bundaleer for an inspection visit in order to ascertain if and what work would be required to prepare these climbing areas for re-opening. Being woken up by thunderstorms and pelting rain at about 4am in the morning was not the best sign for the Saturday morning visit of Mt Rosea and Bundaleer. But come to think of it, the last time I did such an inspection visit was after the 2006 fires. And it rained then. Classic Rosea inspection weather! Wet weather gear was packed by all. Along with myself, I had organized a small team of interested climbers to attend. Steve Monks, Kieran Loughran, John Stone, Frank and Sylvia Van der Peet and Cameron Abraham all dragged themselves out of a warm bed for the 9am meet at the Parks Depot in Halls Gap. There we met with David Roberts where we carpooled into 2 cars and headed off. First stop via the Stony Creek Road and Rosea Track was Bundaleer. After heading through the locked gate and driving a little way, it was soon very obvious as to why there was a locked gate and why after a few 100 metres, we couldn’t drive any further. To say that there was some rutting in the road would be a serious understatement. More like there was a road attempting to travel through the rutting- as you can see by the photos. After a bit of discussion about repair progress and insurance coverage for such events – interestingly, the Insurance will only pay for the top orange layer of construction added soil. The rest of the damage in the soil below this is up to PV to find the funds for. Insurance companies – you gotta love em! We then headed up the climbers access track to Bundaleer. 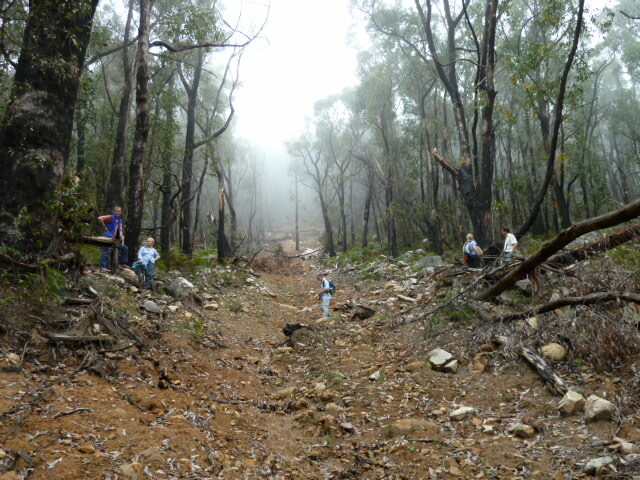 The same track where in 2008, we spent a day building and repairing the track following the fires. Well, we obviously did something right as the track is still holding court. Bar a few areas that have had a little wash down and were troublesome areas from the start. But definitely gets the tick of approval and can’t see any reason why this track can’t be used. Once we were finished with Bundaleer it was off to Rosea – reversing back up the section of road we travelled on to the intersection. We then travelled down the Silverband Road to finally arrive at the Rosea carpark. Have to say it was lovely to be back at Rosea after quite a long time since my last visit and the low lying mist gave Rosea its usual atmospheric feel. The official walking track was good for the most part, with just a few sections that were rutted. We then veered off left at the signage intersection to travel along the climbers access track. Besides the usual abundance of bracken along the track all looked good and was holding up well. Some of the work we had undertaken following the fires had definitely done its job. The stabilizing work we had done on a small collapsed section of track would definitely have prevented that whole section from collapsing and being washed away. Various landslips along the way seemed to have missed our track – but of course, they were only the babies! ,A little further along, the track wasn’t so lucky, as was a huge swathe of land. Basically, the track just suddenly ended as did all the vegetation. Huge, bare new gully from very, very top all the way down cutting through to Silverband. While these photos give you an idea it still doesn’t do it justice. The power that must have been behind all that water and moving earth! After much oohing and aahing, we travelled across the new gully to where the track began again and continued on our way. Again for the most part the track is fine and stable. Just before the last switchback to the cliff base a massive tree has come down over the track. It is possible to scramble underneath this. On the other side of it there has been some smaller trees come down, lots of branches covering the track and some slip and wash away of the track. 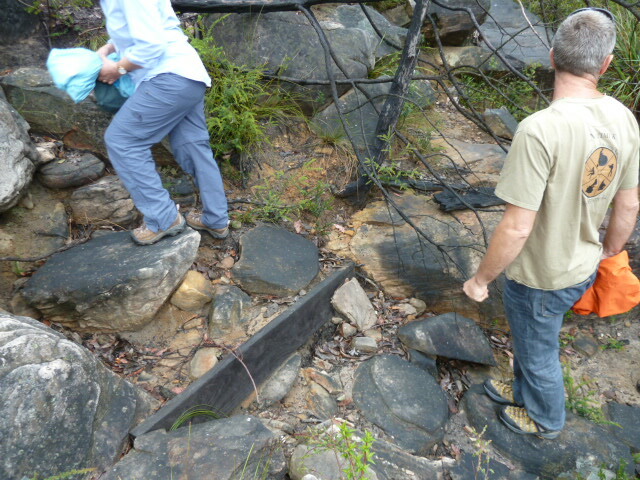 Damaged track section before last switchback. After this the switchback itself is fine and the track continues up to the base. We travelled to the top of the Giant Staircase which has held up brilliantly and doesn’t really appear to have suffered much in the way of wash away and erosion. Possibly a few loose base stones here and there but certainly nothing that you wouldn’t expect from a rocky track. So, the question is where, what and how does this leave us, the climbing community. Well despite the awesomeness(cos that’s the only word that describes it!) 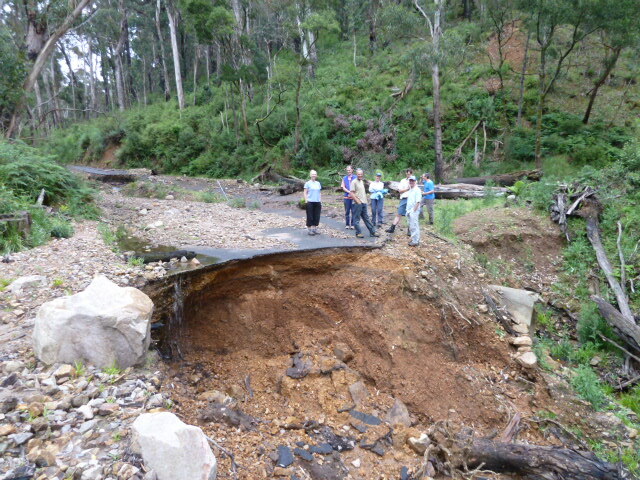 of the landslide damage to Rosea, not too bad really. 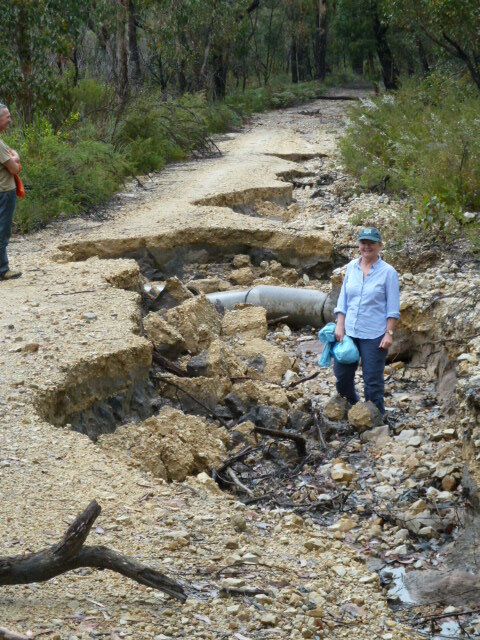 There will be no repair to the newly created gully. That’s nature creating something new and will become just another part of the Grampians environment. Over years it will revegetate and generations from now will only see it as we currently see treed gullies. And probably none the wiser to the event that created it. After discussion with Dave, we will delineate a new track from one side to the other giving it a little stabilizing work. And with Nature having done most of the work of clearing everything, this really shouldn’t be a big job. The trees down on the track will make access along the track a little more difficult but even if nothing was done, you could still travel along it. The larger tree will need serious cutting equipment to move it and Dave has indicated that this is something he could help out with, along with another tree a little further before this. We are more than capable to cut, remove and clear the track immediately after the large treefall…and for the most part, that’s it for Rosea. As the access track to the cliff base is a climbers access track, the climbing community will take responsibility for maintaining this track and take care of any erosion issues that occur on the Giant Staircase. Time frames for opening are dependant on a few things. The main issue is the road access. Dependant on Vicroads plan of attack for their work on the lower Silverband road, there is the possibility that we may be able to access and use the Rosea carpark on weekends. This decision does rest with Vicroads though and their contractors work plan. The Rosea carpark will be used by them for their vehicles and materials etc. Possibly we can access it via a walk in from the Sundial carpark if the reopening of that section is not possible. Alternatively the access would be via the Stony Creek Road. It would mean having to access it via the longer way around – Mt Victory is now completely open. Would be great before Christmas but probably not likely – stay tuned as I will have some better timelines shortly. Bundaleer is on the cards to open before Christmas. Work on the Rosea Track is targeted to begin start of December. Regardless of this, there are still some options to be able to access the area. Just might mean a little more of a walk with access stopping up towards the intersection of Rosea Track and Stony Creek. With regards to any work we may need to do at Bundaleer – well that is minimal and the opening is certainly not dependant on that. All in all it was a very positive visit and day not only from the Bundaleer and Rosea aspect but also from a relationship perspective between the climbing community and the land managers, Parks Victoria. David Roberts is keen to continue moving forward in developing the relationship we have with them in a positive way. Many thanks to Dave for making time in his schedule. 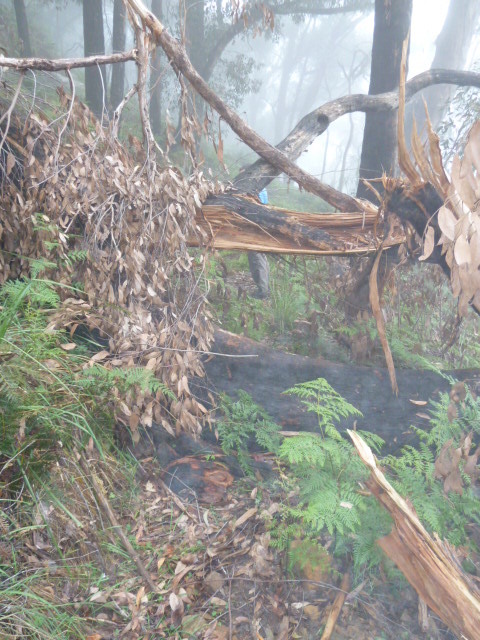 This entry was posted in Access &Environment officer reports, Grampians and tagged grampians, reopenings by Tracey. Bookmark the permalink.